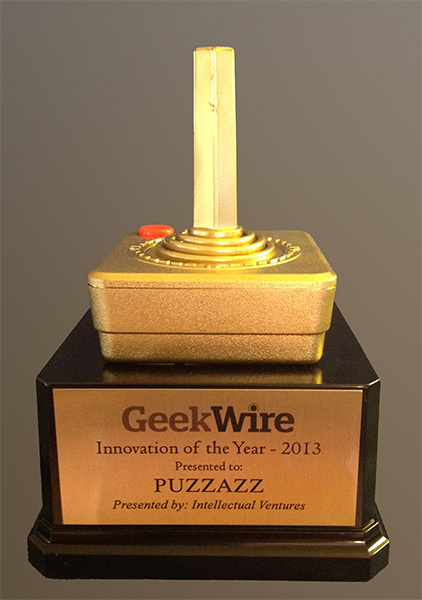 We are very pleased to report that Puzzazz won GeekWire's 2013 Innovation of the Year award for our TouchWrite handwriting technology. Winning the award is great validation that we're doing things right. Todd Bishop, GeekWire co-founder, said "TouchWrite is an awesome technology. Literally, they brought handwriting recognition technology to iOS. It's a really deserving award." The unique award trophy looks very nice on the fireplace mantle in our office (our office is in an old house, so, yes, we have a fireplace). Celebrating done, the team is already back to work and super excited about our upcoming releases. Check out GeekWire's awards wrapup for complete information, and, while you're at it, enjoy the fun intro video they used at the event.